Perhaps no aspect of woodworking inspires as much trepidation as applying a finish to a completed project. Done correctly, it represents the crowning achievement of a job well done and can almost make a wooden object come alive. Done poorly, it highlights and magnifies construction imperfections while almost commanding one’s gaze to these areas. Plywood is a popular building material for a variety of furniture and DIY projects and finishing plywood comes with many of the same finishing challenges as projects constructed of solid wood. The type of finish used for plywood depends on the project and the type of plywood used. Plywood normally comes in 4’ x 8’ sheets with a face (top) side and a back (bottom) side. The face and back are graded according to the quality of the wood and surface preparation. In the USA, the face is given a grade from A–E with A being the highest quality and the back is graded from 1–4, with 1 being the highest grade. Therefore, A1 plywood is the highest quality (furniture quality) and comes naturally at the highest cost. In Europe, the only difference comes from the grading of the back side (given grades from B–D with B being the highest). For high-end furniture and cabinetry projects, using A rated plywood makes the most sense. “A” rated plywood should be smooth, free of knots and defects, visually appealing, color matched with no heartwood-sapwood color changes, and few (if any) mineral or vine marks. Putting a finish on “A” graded plywood requires a little extra care during the final sanding preparations because these face veneers are incredibly thin, often a little as 1/30th of an inch, and aggressive sanding can actually result in sanding through the face veneer, ruining your project. Once sanded, the finish on the face side of a drawer (say in a kitchen cabinet) takes the same finish as the rest of the cabinet’s face frame. The inside plywood of a drawer requires only a couple of coats of a sealing finish (polyurethane, shellac or varnish) to protect the wood. However, finishing a drawer in a dresser requires a little more effort, particularly with the preparation of the surface. If the surface isn’t very smooth, sanded to 220 or finer grit sandpaper, wood fibers may catch on the clothing stored in the drawer. Several thin coats of polyurethane seal and protect the wood while also protecting clothing from snagging on the wood itself. Other projects that involve plywood construction are workspaces, such as workbenches or desks. The function of a workbench is to hold things on a relatively flat surface. 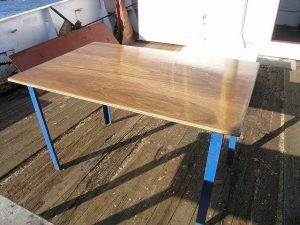 While most workbenches don’t require the same level of care and finishing attention that fine furniture does, they do need some form of protection from changes in humidity, while remaining relatively easy to clean (glue, drips, spills, etc.) and looking good. 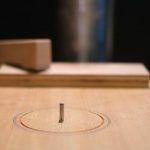 Finishes that produce a hard/slick surface such as lacquer, polyurethane and shellac make it more difficult to hold things in place without slipping, so a finish that penetrates and protects the wood is the preferred choice. A good compromise finish for protection, penetration and beauty is a 1:1:1 mix of a good oil:varnish:thinner. Tung oil or boiled linseed oil both work well to penetrate the wood (with boiled linseed oil being the more economical choice); varnish or polyurethane both protect the wood well. Adding a thinner to this mix allows the oil/varnish mixture to penetrate deeper into the wood. To further protect your bench and give it a little extra luster, adding beeswax or carnauba wax to the mixture and then buff it out once the mixture dries. Don’t add too much wax, otherwise the bench will become too slick; though adding wax makes cleaning up spills (such as glue) much easier.